Remember this post from a few days ago on Lake Urmia in Iran? 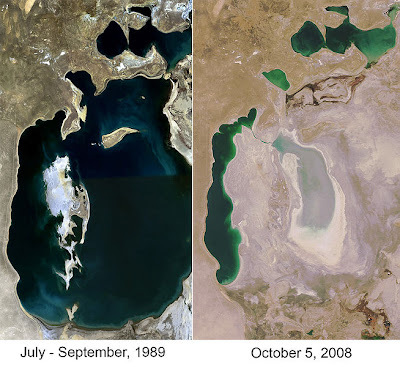 I noted that at least the drying there wasn't as severe as that found in the Aral Sea, which has seen some pretty drastic drying over the past decades. Just a few days later, the UN's Ban Ki-moon is due visiting Uzbekistan where he has toured the Aral by helicopter and called the drying of the lake (a total of 90% of its original volume) a "shocking disaster". Turkey's TRT has a few images here of the area from yesterday.